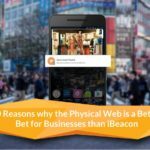 Through our interactions with various developers who are working on iBeacon technology or are trying to/planning to build an iBeacon app, we have realized that they all face one common issue – not knowing how to deal with real-world issues that come up in the process of building an iBeacon app. While there is a lot of information available around this on various developer forums, blogs etc., they are all in different silos and difficult to tie together. To help developers overcome such challenges and learn how to build a beacon app from scratch, we are thrilled to announce our new ebook: A Developer’s Guide to Building an iBeacon App . The book covers everything you need to know – from basic beacon terminologies to common challenges and solutions to mistakes to avoid and best practices to follow when building an iBeacon app. The need for this ebook is fuelled by our belief that the full potential of BLE and iBeacon technology will come from what developers around the world apply it to with their collective imagination. If you have any more questions around beacon app development, you might want to register for our live online developer course on ‘Creating a Beacon-enabled Retail App’ that starts on Tuesday, 8th March, 2016. In this course you will see a live demo of a beacon app being created from scratch. Register for the course now.